Neuromas of the feet can be pain free or so painful they cause you to stop what you’re doing and even have to get off your foot, remove your shoe and rub it to try and find relief. They are frequently found in women, although they also occur in men. If it is between the 3rd and 4thtoe base, it is usually called a Morton’s Neuroma which is the most common site for it. 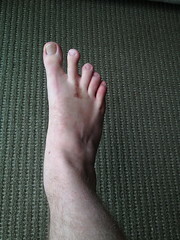 It can occur between the other toe bases as well. The symptoms are variable. “I have burning, aching, throbbing, tingling, electrical, sharp, shooting, stabbing pain”; “It feels like I have a marble in my foot”; “It feels like someone took a knife and just shoved it in and out of my foot when I stepped down”; ”My toes are spreading apart”; “I have to suddenly remove my shoe and rub it”; etc. You name it, I’ve probably heard it. Many blame improper shoe fit as the cause of a neuroma. Since many women wear shoes not well designed to fit their feet, it may be why women more frequently experience this condition. However, faulty shoe fit does not address the cause of the problem. Shoes simply aggravate the condition similar to bunions and hammertoes. Ill fit shoes are not always the cause nor are they the cure. Sometimes wider shoes may increase the neuroma pain. Evidence suggests that neuromas are usually caused by the way your metatarsals move (the long bones in your feet that run to the base of the toes). When standing and propelling/pushing forward, foot bones not in proper position may rub together, pinching the nerve and causing inflammation, neuroma and pain. Some people will report that if they wear a tighter shoe, it doesn’t hurt. The reason is that the tight shoe holds the front of the foot in a more locked or corrected position so the metatarsals don’t move and rub together. Wearing a wide shoe may cause pain, because the metatarsals can move around the nerve more easily, pinching more and producing more pain. Neuromas are more often by improper foot alignment and lack of foot support. Dr. David Sables will thoroughly examine your foot and determine theproper supportive measures needed to treat your neuroma. Stop by ArchMasters, a shoe store and a whole lot more. The Price Paid For These Shoes — Way Too High!